RxSorbo has created a series of blog posts on the topic insoles for cleated footwear. The series specifically covers the sports of football and soccer, but the material is germane to related sports as well. Sports that rely on cleated footwear are in full swing at this point in the early Fall, and after the first couple of practices or games it is probably beneficial to step back and take stock. 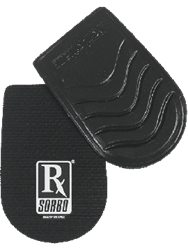 RxSorbo, a leading online retailer of top-rated shoe insoles, is pleased to announce an updated, September, 2015, series of blogs posts covering insoles for cleated footwear. The posts contain information suitable for aiding in the choice of insoles for football players and soccer players. This is just in time for the kick off of many High School and college athletic programs. The shoe is the first line of defense for the body against shocks transmitted through the foot up into the ankle, leg, and all the way to the spine. Along with properly selected footwear, insoles for cleated footwear are a component in the strategy of reducing transmitted shocks, and thus preserving the athlete’s lower body from excessive wear and tear. To learn more about insoles for cleated footwear, please visit a sample post in the series at http://www.rxsorbo.com/rx-blog/insoles-cleated-footwear-secret-weapon-soccer. To view other posts, simply click on the 'tag' 'cleated footwear' as indicated in the post. To browse available insoles for related sports such as running, please visit http://www.rxsorbo.com/insoles/football/ or use the left site navigation. There, one can browse the company’s classic heel pads, classic insoles, and the all whole line of shoe insoles for sports such as football or soccer.